District 6000 along with Heartland Rotary Leadership Institute offers this training. 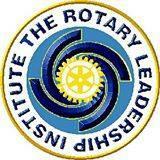 Newer Rotarians are encouraged to participate but all are welcome that want to learn more about Rotary. Parts 1,2 and 3 must be done in order. The cost is $85 for each Part and includes breakfast and lunch. Ask your club leaders if they will cover the cost for you to attend. Register early to be sure arrangements can be made for the sessions. Terry Geiger, District R.L.I. Chair tlgeiger@grm.net or 641-442-5559.